I've been trying to figure out what I'm wearing to Maryland Sheep and Wool this year, so I can blog it so if any of you are there, you can say HI. Unfortunately, I'm not sure what the weather is going to do this year, so I'm not entirely sure. It does look like it's going to rain, but whether it's going to be intermittent or a downpour all day, I don't know that either. I will be carrying the bag in the photo (it's the same bag I carried last year and it worked great size wise for my junk), but I'm not 100% sure on the Crocs yet. If it's pouring rain, I won't wear them, but if it's just doing light rain off and on, I might. Last year it didn't rain and my feet were black when I came home. On the other hand, feet wash off, Crocs rinse off, and then can be put in the dishwasher. Earlier in the week they were saying it was going to be in the mid 70's, but now they've dropped the expected high temp for the day, so I have no idea if I'll wear jeans or capris or a short sleeved shirt or a cardi. Basically, I'll be there on Saturday, I WILL have the bag, I MIGHT wear the Crocs, and anything else is just up in the air. 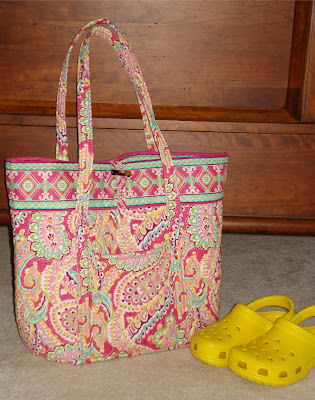 If you see a brunette with this bag, yell "Pink Lemon" at her, and if it's me, I'll turn around. If it's someone else, they probably won't. I do plan on going to the Ravelry meetup in the Rabbit building sometime between 11:30-1:00. Please don't be shy if you see me, I love meeting people who actually read my ramblings! Unfortunately, I don't know what you guys look like, but I've blogged pictures of myself before, so that should help. If I can narrow down what I'll be wearing better in the next two days, I will, but I don't know for sure if I'll be able to post both days - trying to get everything ready for Saturday and next week is going to be crazy around here, so I need to get some stuff taken care of ahead of time for that too. WooHoo! What you see above is what I have left after completing the front. 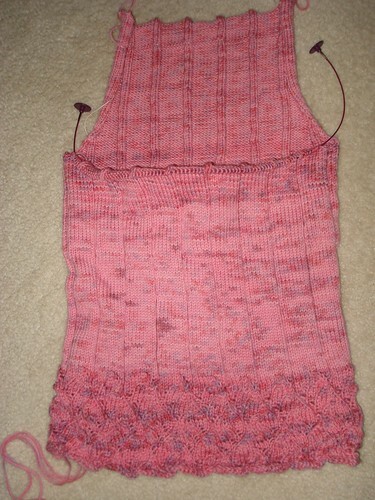 The bit of yarn on the lower right should be enough for the neckband, so I can use the other pieces for the seaming up. This is all that's left of 4 skeins of the Dream In Color Classy (250 yards each). I'm going to be sewing the shoulder seams and doing the neckband today, then I'll block all the pieces and sew the sleeves into it when it's all dry, but I won't bore you with another picture until after it's all done. Where Knitting and Survival Collide - or maybe not. As any of the survival guides will tell you, whenever you find yourself in over your head, take a second to calm down and assess the situation so you can think clearly. The same is true of knitting, although the dangers of hyperventilation and broken limbs are vastly reduced from those of an outdoors survival type situation. I have spent quite a bit of the last few days looking at the Chinese Lace Pullover, deciding how far to go on the body knitting before starting the armholes. (According to the pattern requirements, I have 90 yards less yarn than I should have, and by eliminating the waist shaping I've already used more yarn than the actual pattern. I've also lengthened the body of the sweater. I have no idea what going from raglan shaping to set in sleeves does to yardage requirements.) There has been a lot of smoothing and measuring, looking at the Chinese Lace Pullover pattern and comparing it to Jaeger's Ronnie (the sleeve cap and armhole pattern I'm using to avoid any further thinking on my part), looking at the amount of yarn I have left, and just general thinking about what my gut is telling me about how much farther I can go on the body before I start armholes. (When in doubt, always listen to your gut.) Finally, I was ready, so I started the armholes, dividing the front from the back, and went for it. At one point, there were questions about how much yarn I would have. The back does take more yarn than the front because of the height of the neckline, but I was seriously worried about even getting the back neck done with the yarn I had. I put in a lifeline and went for it. I had enough yarn to finish the back, as you can see in the picture. Theoretically, this should mean that I have enough yarn to finish the front, but then there is a very narrow neckband to be worked and seaming to be done. The seaming can be done with a different yarn that matches colorwise, but the neckband must be done in the sweater yarn. Is it possible? Tune in tomorrow, same Bat Time, same Bat Channel and see for yourself! I'm not dead, but my router is! Yesterday morning I sat down to the computer to blog and I couldn't get online. I glanced at the router and it wasn't happily blinking away like it usually does (it's a very cheerful router, I think, as routers go). In fact, it only had one light on and it wasn't the power light. I checked the cords - all of the cords at both ends - and everything was plugged in, so I called Verizon FIOS to get them to fix it. I got the computer voice and to be fair, the computer voice was able to resend a signal to one of our TV box thingys (the FIOS equivilant of a cable box) a while back and fix it without me ever having to talk to a person. Yesterday, the computer voice thing wasn't really helpful. She also wouldn't let me go back and when I asked for a person she was most insistent on not putting me through. I tried and tried to get the computer voice to give me a person (just FYI, when you yell some maybe not nice things about computers to the computer voice, it just continues in it's completely rational computer voice about how it didn't understand that and could you please repeat it. Really?) I even tried calling back and the computer voice answered the phone and told me that I was in the system and I would be contacted. This morning, the router was buzzing. It got turned off and unplugged before it blew up the whole house and I called Verizon again. This time I was able to go around the computer voice and got an actual person who helped me and is now sending us a new router and told me how to go online without using the router (you can plug the computer directly into the wall thingy - who knew?) So obviously, I'm back now! I loved all the comments about the plague book and have written down the titles you guys suggested to request from the library. By the end of the summer, I'll probably be dressing the whole family in bio hazard suits, but that will just give Caleb a really great story for "What I Did On My Summer Vacation..."
Since this is a knitting blog, I thought I'd mention what I'm knitting. 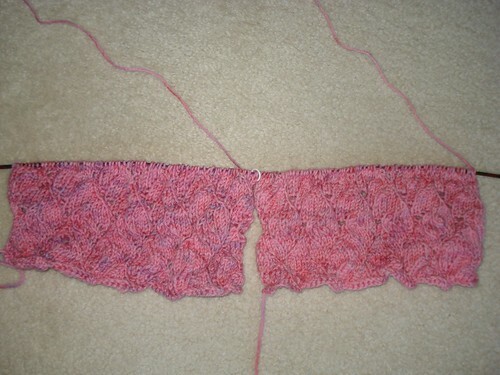 I've finished the sleeves on the Chinese Lace Pullover and I've added about 5 or 6 inches to the body. I'm getting close to where I want to start the arm holes and then I should be able to get it finished up pretty quickly. This has been a pretty fast knit, even with the problems I've made for myself. I think if I'd actually followed the directions, I'd be done by now. I'm off now, I've got to find a bio hazard suit for a cat and a big dog - we've got to keep the tail wrapped here people, there will be no deadly microbes sneaking in by the wag wag! Anyway, I have a well developed taste for useless information. This is probably why I find the Internet and Libraries so wonderful. (I could happily spend days just clicking on links in Wikipedia entries and wander all over the place as subjects go!) The other day we were at the book store and I was looking through the History section and I found In The Wake of the Plague: The Black Death and The World It Made, by Norman F. Cantor. Yep, I'm reading about the Black Death. It's actually an interesting book and while it discusses the diseases that were probably the cause of the event we call The Black Death (yes, it was more than one epidemic), it primarily emphasizes the changes that came about as a result of the plague in the mid fourteenth century and how those affected both Medieval society (particularly focusing on England) as well as the effects we still feel today. For instance, property law as it is practiced in the US today (being a former British colony, we kept many British ideas, even after The Revolution) was defined in large part in the late fourteenth and early fifteenth centuries, as a result of the devastation of the plague. Specific deaths of plague, and the results of who inherited what after these deaths, set events into place for the War of the Roses. As you can see, the interrelatedness of so many things and how they were affected by a devastating epidemic is just right up my alley. If you enjoy exploring the depths of useless information (which is nevertheless pretty interesting), you should check this book out of your library sometime. Sometimes when you knit yourself into a hole it's not nearly as bad as you thought. Yes, we're still on the mess I made with the Chinese Lace Pullover. I didn't frog the sleeves or decide to go the distracting pom pom route on the raglan seams. I decided to redesign the sleeves as set in sleeves rather than raglan, going completely around the big problem I'd made for myself rather than solving it head on. I got out the paper, pencil, calculator and chocolate and sat down to figure sleeve cap and arm hole shaping, but then I got hit in the head with one of those giant idea lightbulbs! As you can see from the picture above, I'm well into the sleeve cap shaping. I know I've been a bit of a one trick pony on this sweater on the blog - usually I'm knitting on 10 different things at once - but I really want to get this done before it gets really warm here (and before I forget what I'm doing since I've changed so much around), so if you'll bear with me on this, I hope to get this sweater done this week. Before I really get into today's post, I just want to make sure that I point out something about the Chinese Lace Pullover fiasco from yesterday's post - it's not the designer's fault! This is a beautifully designed pullover, a well written pattern, and probably involved a lot of work with a calculator, graph paper and chocolate (I use chocolate when I'm designing something complex, also Ramius helps). If I had just knit it as it was written, I wouldn't have any trouble at all. So please, don't think that you want to avoid the Knititude patterns just because of my Sleeve Incident. Any difficulties I'm having with this sweater are entirely of my own making. I'm not sure what that says about me, to tell the truth. Angela (the designer) even left a comment yesterday volunteering to help me work out the problem without frogging the sleeves, and while I deeply appreciate the offer, I want to see if I can get myself out of my own mess first - don't worry, I have a calculator, graph paper, and chocolate, and I'm not afraid to wake up the cat if I need to. After writing yesterday's post and having the lightbulb realization that I had effectively messed up the way the sleeve and body come together, I spent the rest of the day mentally kicking myself, shopping (did you know Philosophy has a wonderful Pink Lemonade collection right now? ), and trying to weasel my way out of my problem without frogging anything. I actually spent a bit of time thinking that just turning the body 1/2 repeat would solve my problem and make the ribbing lines come together. That would have put a column of purl stitches right up the center of the sweater and that's just not good design. I also realized that if I just frogged the sleeves and knit them the way the pattern was written, the ribbing lines wouldn't line up that way either, because by eliminating the decreases in the lace pattern, even though I had the same stitch count I was supposed to have on the body, the ribbing would be different for my sweater's body than it would be if I had just followed the pattern like a good knitter. * Basically, what happens is that you work the decreases in the lace design as the pattern is written, and then work your increases on the sides of the front and back pieces, where a side seam would be. The lace design sets up the ribbing pattern, so by placing the decreases into the lace design, you are changing your ribbing pattern before you even start ribbing. 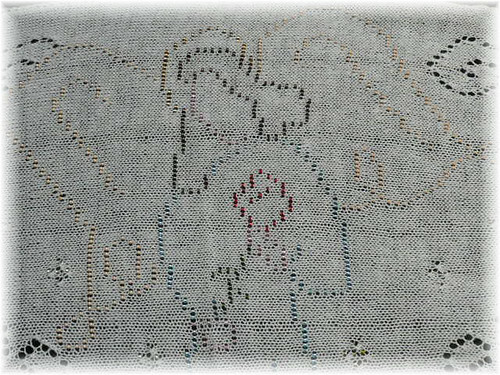 In other words (and this is totally not the pattern, I'm just using this to illustrate the depth of the hole I knitted myself into on this), the lace pattern kinda looks like P2, do lace pattern over the next 11 stitches, P2, do lace pattern over the next 11 stitches, and so on. When you work the decreases, you are taking stitches out of the 11 stitch lace section (again, not at all the actual numbers used in the real pattern) and you end up on your last round of lace with P2, do lace pattern over 7 stitches, P2, and so on. Then when you start the ribbing, you just work as established, purling the purl stitches and knitting the stitches you were working lace over: P2, K7, repeat. By eliminating the decreases (and thereby making a huge, honking mess of the beautiful design), my ribbing looks like P2, K11, repeat. So even though my stitch count is the same, the ribbing is different, and I probably messed up the ribbing situation when I was working on the body, when I decided to just use the ribbing and natural bounciness of wool for my waist shaping. I should probably be thankful that I figured it out now and not when I was seaming the sleeves into the body of the sweater. 1. Continue as started and instead of the delicate, diagonal raglan line where the sleeve meets the body as the pattern is written, make the line much more prominent and wider, thereby completely distracting the viewer from the fact that my ribbing doesn't line up. Unfortunately, the only thing I can think of that's distracting enough to hide my ribbing fiasco involves copious amounts of bobbles and pom poms. I think this option might make carrying a purse and wearing a seatbelt difficult. On the other hand, it would make a great travel sweater - I'd have a built in pillow! 2. I could frog the whole thing, sleeves and body (remember, I haven't knit the entire body yet) and re-knit it as the pattern is actually written. Since I bought the pattern because I really liked the design, I could always knit the actual design that I really liked. I know, SHOCKING! 3. I could give myself one more smack upside the head for not doing what I was supposed to and redesign the whole thing with set in sleeves and thereby completely go around the actual problem of getting the rib to line up on the raglan. Personally, I'm kind of leaning towards choice 3. This option would also avoid frogging and reknitting, which at this point in the year, is a really good thing - it's tough to get a wool sweater finished when it really starts warming up. *One of the reasons many of us knit is to be able to personalize and change things around so that our sweaters are flattering to our own body's shape and size. Most of the time you can change some things around and you won't have any trouble. Clearly, changing a raglan design with a bold ribbing pattern is an exception. And if you were wondering if this means I will now knit all patterns as they are written by the designer from here on? You're totally kidding yourself! I've been working on the sleeves I cast on for the tutorial last week and I've just finished the lace. The next row will be the ribbing, so it should go much faster. These sleeves represent a first in Pink Lemon History - this is the first time I've done lace patterning on wrong side rows! I've done lace every round on socks as well as the body of this pullover (since I knit it in the round), but I've never worked lace every row on a flat piece. The wrong side rows were a bit slow going at first, but since this lace design has a rhythm to it in four row increments, it wasn't too bad once I got my mind around it. I made the same changes to the sleeves that I did to the body of the pullover - no decreasing. The sleeves are 3/4 length (love that length - great for bracelets!) and the lace section bells a bit in the original pattern before being decreased and then increasing in a normal sleeve shape. I love this type of sleeve, but I decided to go with a classic, no frills sleeve. If you've been watching sleeve shapes in fashion lately, the slightly large, gathered sleeve OR a very exaggerated bell that gathers at the elbow are what's on trend right now. The sleeve on this pullover as it's designed is a more subtle (and wearable) bell sleeve, but I don't want to pull out this sweater in a year, look at the sleeve and say, "That's so early 2008!" I've said it before and I'll probably say it 249 more times before I'm done - classics are classics for a reason, so I went with classic sleeve shaping. In order to do that, I not only eliminated the decreases at the top of the lace, I cast on one less repeat in the lace pattern. OK, After writing all of the above, I just realized that I might have messed myself up in all this redesigning and sure enough, I have - if you look at the picture of the design, you can see that the designer, Angela Hahn, has made the ribbing pattern line up from the body to the sleeve beautifully. In my tinkering with the design and eliminating one repeat of the lace (and thereby one section of ribbing (bad Pink Lemon, bad Pink Lemon), I won't have the ribbing line up nicely. I will have to frog the sleeves and refigure the sleeve (or I could just knit it the way the nice designer designed it instead of second guessing the pattern.) OK, never mind any of the above post - the sleeves are off to the frog pond! Another lovely, lace design from Georgina Bow Creations! The Angel of Music Wrap is inspired by The Phantom of the Opera. The beauty and mystery of the romance as well as the choreography of the dancing are enchanting. The antiphonal passages, the duets, the candles, and the curling mist all enhance the illusion. The character of the angel of music and the red rose left for her by the phantom are of course, central to the tale. 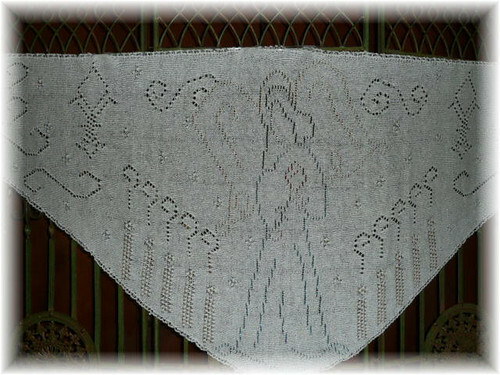 All of these elements are represented, either by lace motifs or by beads on the stole. Optional design elements of bells and a harp can replace the fleur-de-lis and the rose to give the angel a Christmas theme. The shaping of this wrap is unique, part stole, part triangle shawl, it measures 65.5 inches long across the top and the width at the ends is 7 inches. The center of the wrap is 23.5 inches wide. Extensive beading reveals the story behind this design. There are no options given for adding additional length to this design. Shown in Jaggerspun Zephyr Woolsilk in Ivory. This stole uses less than 900 yards of laceweight yarn as written. Please see the pattern for details about beads. After downloading and saving the pattern file to your harddrive, please print the pattern in color, in order to see beading details. Georgina Bow Creations Patterns, while available on Pink Lemon Twist, are separate from Pink Lemon Twist Patterns and therefore, we cannot combine purchases from both companies into one transaction. We apologize for any difficulties this might cause. 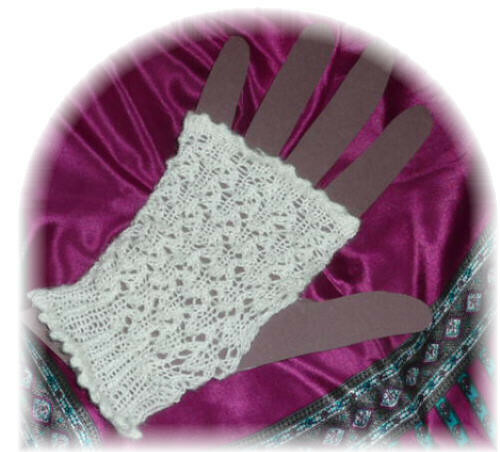 New from Georgina Bow Creations, Designer of the upcoming Mystery Stole 4, Lady Lace Mitts! Knit in laceweight yarn, these delicate lace mitts are designed in two lengths: shorter glove length mitts as shown, and a second version that goes farther up the arm for more lacy drama. These are perfect for formal occasions like proms or weddings, but those of us who enjoy lace and feminine styles will find them to be the perfect accessory for a wide range of events. Personally, I think these would be just the thing peeking out from the cuffs of a leather jacket. Using only a small amount of yarn, they are perfect for using up leftover partial balls of laceweight yarn after you've completed your newest shawl. These are quick to knit and would make lovely gifts as well. 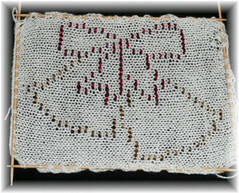 Stitch patterns are given as charts and as written out directions, so they are accessible to most any knitter. These are knit towards the fingertips. Minimal shaping is necessary as lace has a natural elasticity, making this design appropriate for even a beginning lace knitter. The shorter length of the mitts uses approximately 150 yards of laceweight yarn and the longer length mitts uses approximately 500 yards of laceweight yarn. 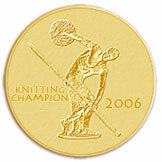 Shown in Jaggerspun Zephyr Woolsilk (630 yards/ 2 ounces). Because Georgina Bow Creations Patterns are separate from Pink Lemon Twist Patterns, we cannot combine pattern purchases from both companies into a single transaction. We apologize for any inconvenience this might cause. I've mentioned before that when I knit sleeves or fronts of cardigans, I work them both at the same time, on the same needles. The other day Samantha of the Comments asked if I could show how I do this. 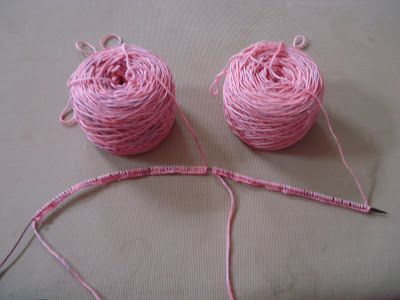 There are a number of tutorials on the Internet for knitting two things in the round at once (two socks at once, for instance), but not for knitting things flat. Before I begin, I am aware that it's possible to knit two things at once in the round, and for these sleeves, it would be one way to handle it. The Chinese Lace Pullover pattern is written for knitting both in the round and flat. I do not particularly enjoy circular needles in much the same way that elephants do not particularly elevators. (I can tolerate the KnitPicks circs because I don't spend all my time fighting the joints and the cables.) The idea of messing around with circulars to the extent required to knit two things circularly at once makes me violently ill. If you enjoy that kind of thing, please continue to enjoy it, but I don't really care for it myself (see above, the violently ill part). For this tutorial, I will be using the KnitPicks circular needle that I've knit the body of this sweater with. I'm doing that because I want my gauge to stay as close as possible to the same between the body and the sleeves. (Just knitting the body in the round and the sleeves flat is enough to cause gauge changes if I'm not careful.) It's entirely possible to do this on straight needles, and in fact, I recommend it on straights for your first time because it will eliminate the opportunity to turn the work before both items are worked (I'll explain farther down). To begin with, you'll need a set of straight needles or a circular needle (see above about starting with a pair of straights) and two balls of yarn. It's entirely possible to use one ball of yarn and work from both ends of the single ball, but that gets pretty twisty and irritating, so I prefer two separate balls. 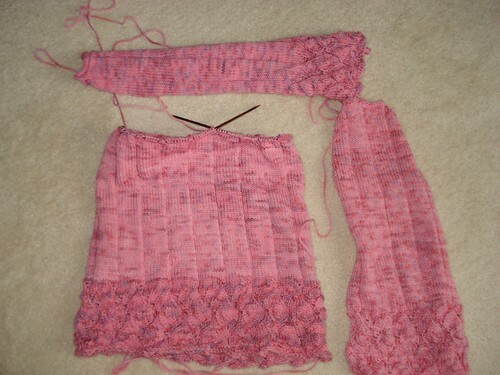 Using one ball of yarn, cast on the required number of stitches for one sleeve/one front. Use whichever cast on you prefer. I tend to use a long tail cast on for most things, but this sweater starts out with lace so I'm using a knitted on cast on which is more flexible. Notice that for this reason the yarn tail is on the left with the working yarn leading back to the ball on the right. (In a long tail cast on the yarn tail would be at the same end of the cast on stitches as the working yarn. 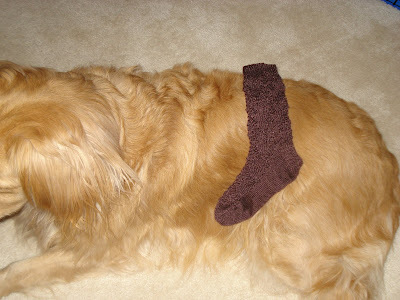 The yarn tail doesn't matter and I will no longer discuss it, but I didn't want anyone to be confused by this cast on.) The most important part to note is that the working yarn is on the right at this point. 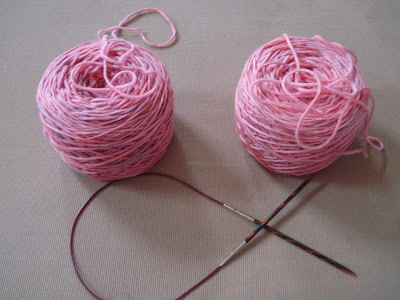 Now, drop the working yarn from the first section you cast on. (I'm assuming you have double checked your counting and you have in fact cast on the correct number of stitches for whatever it is you're knitting at this point.) 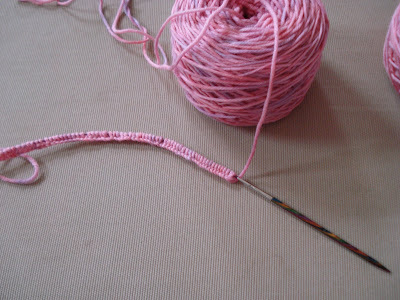 Make a slip knot with the yarn from the second ball and begin your cast on for the second sleeve/front. Once you've cast on the required number of stitches for the second sleeve/front, you will have something that looks like the picture above. Note that for each cast on unit the working yarn is on the right end of those stitches. I'm now ready to start knitting the sleeves. Once I work across the first sleeve, I will drop that working yarn and pick up the working yarn for the second sleeve (note that the first sleeve I knit on will be the second sleeve I cast on - don't overthink it, just knit). The most important thing to remember when knitting this way is NOT to turn your work between sleeves/fronts. Always knit a row on BOTH sides before turning your work and working back. 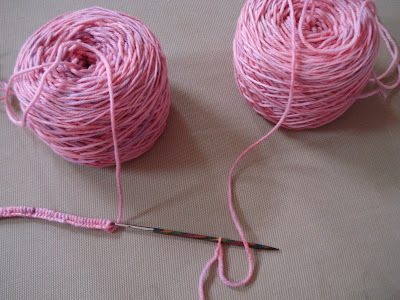 If you're working with a pair of straight needles, you will only turn your work when both pieces of your knitting are on the right needle. It's the circular needles that are easy to get confused with. I use row counters when I knit and I always set it up so that odd numbered rows are right side rows. Being consistent with this, I can figure out which side isn't knit if I have to set down my knitting between pieces, before completing the row on both parts. The benefits to knitting both sleeves/fronts at once are that I don't suffer from Second Sleeve/Front Syndrome, my gauge stays the same over both pieces (even if I'm stressed and knitting tighter one day, the tighter section will be on both parts, rather than one), and I'm more likely to get my shaping in the same place on both pieces. Most sleeves are identical, but cardigan fronts are mirror images of each other. It's easy to mirror the shaping with both halves of the front right next to each other - the space between the two fronts becomes the center space of the cardi. Hopefully this will clear up any questions you might have had about how this works. Once you get everything cast on and start going, it's pretty easy to see how the whole thing works, but if you've never done it before, it can be easy to overthink and make it more complicated than it is. I know I said I was going to give a little tutorial on knitting two sleeves at once, but I haven't wound the skeins of yarn yet. I did get two skeins wound yesterday, but they obviously aren't for the sleeves of my Chinese Lace Pullover. 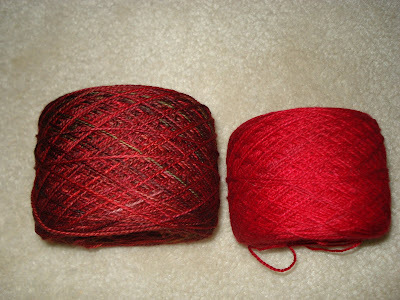 These are the two sock yarns for the Fire Socks pattern. Both are from Fleece Artist and both are the Merino sock yarn. On the left is Burgundy* and on the right is Ruby Red (I think I had more tension on the Ruby Red ball when I wound it so it looks smaller - I'm going to rewind it today). I will get the Dream In Color yarn wound into balls today for the sleeve/fronts tutorial, but it has to wait until after Finn gets a bath - he's getting downright stinky! *I'm not entirely sure that this is really the Burgundy color from Fleece Artist. My Lady of the Lake Cardi was in the Burgundy colorway and I have a skein of Sea Silk in Burgundy as well. Both of those were more plum and berry colors with coppery browns in them. This skein is definitely reds with some olive tones to it. It might be a difference in dyelots, but this seems pretty far off to me, which is why I question the exact colorway. It will work perfectly for one of the Fire Sock designs though! Last night I finished up my second Terra Incognita sock! As you can see, I was able to get it modeled by something big and blond. Lest you think he's a well behaved, well trained puppy, as soon as I snapped this picture, he jumped up, tried to grab the sock (which I got to first), ran in circles and started barking at me. I'm guessing sock modeling isn't part of his contract. Since I had already gotten the picture, he can fuss all he wants. Bwah ha ha! Yesterday Samantha of the Comments (probably not the name on her driver's liscense) asked if I could give details about how I knit two things (sleeves, cardi fronts, that kind of thing) at once while knitting them flat. That sounded like a great idea for a post, so I will do a little tutorial on that for tomorrow. Clearly, I will not be using the big, blond model who is feeling sassy today! 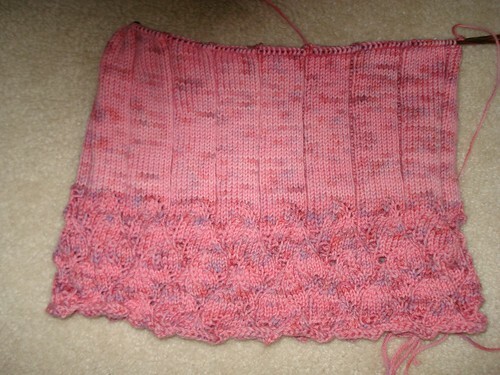 I'm working on the body of the Chinese Lace Pullover now. I've got about 10 inches total knit on it and the pattern says to go to 14 inches for my size before I divide for front and back. I will probably go a little bit longer than 14 inches (maybe 16 inches), just to counteract the potential length shrinking I found in the gauge swatch, and because a little extra length means less fussing where the sweater and jeans meet (and you know what I mean). I have two skeins of the yarn set aside for the sleeves and while I know I won't need all of the skeins for the sleeves, I might go ahead and knit the sleeves, so I know how much yarn I have left over for the body. I'm thinking about starting that today, but first I have to wind the skeins into balls. I will probably knit the sleeves flat so I can do them both at the same time. I'm still loving this yarn and I love the colors of it. 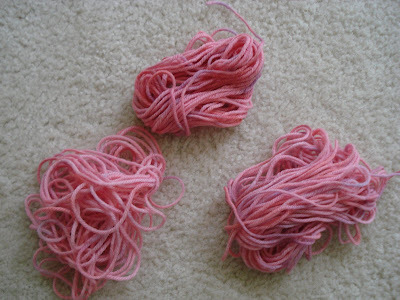 I've always loved looking at hand dyed yarns, but they don't always knit up nicely. I don't like the weird pooling you tend to get with a lot of hand dyed yarns, but this yarn isn't doing anything strange with the colors. I'm beginning to think that I might have found a yarn that I'll be happy using for sweaters. I've stuck with socks with the handdyed multicolored yarns before, because the pooling doesn't bother me on socks. Remember back when Providence was not in reruns, when it played on Friday nights? There was an episode where Syd was dating a real estate developer whose family had ties to organized crime. (I've always felt that the reason the show was cancelled was because Syd dated every single man in Providence and ran out of new ones.) Anyway, there was a scene where they were having dinner and this song was playing in the background. It was in Italian and it was sung by a man. The melody stayed with me - for weeks I walked around singing this hauntingly beautiful song, but I had no idea what song it was. It had an operetic sound, but I didn't think it was actually from an opera - it sounded too new. Fast forward a few years - watching The Sopranos and there's the song again - Carmela was listening to it. Again, no mention that I could find as to what song it was, again the walking around with it in my head for weeks thing. Periodically I would hear it, or bits of it, but I never could find out what song it was. I spent hours listening to the sound bites of songs on iTunes looking for it one day, but I got nothing. Berry Lace Cardi - Finished! All done! 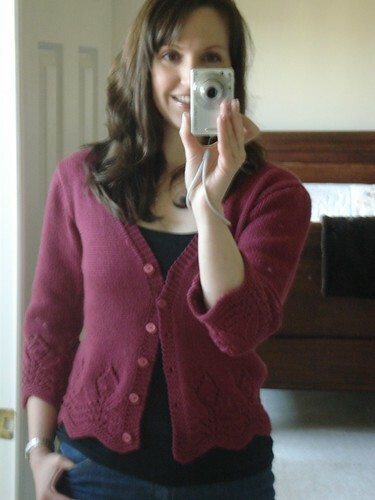 Here it is in the pose made famous by knit bloggers everywhere - the bathroom mirror self portrait! (Sorry about the blurry.) I love this little cardi and I know that it's going to be perfect for the transition seasons of Spring and Fall, just the thing to toss on when it's a little chilly for short sleeves, but you don't really need too much to stay comfortable. The pattern is actually written for cotton yarn, which would take you into Summer's over air-conditioned spaces, but I think I'll get more wear out of it in the wool. Details: Free Pattern from Drops, worked in Cascade 200 (I can't find a ball band to get an exact color number, but it's a regular Cascade 220 color, not a Heather or a Superwash). I did the small size and the only changes I made to the pattern are to change the bobbles to knots (which I gave directions for in one of the previous posts), change the sleeve cap shaping to short rows instead of bind offs, and skip the crochet edging completely. I started blending the different types of wools from Monday's post and look at what I'm getting! The colors remind me of water. This is two passes through the drum carder and while it's not perfectly and completely blended (there are parts that are slightly darker, lighter, bluer, whiter - one fish, two fish, red fish, blue fish - sorry, I got distracted there), I really like the way the batts are looking and I think the slight variation in colors will make for a more interesting spun yarn. Remember how I was thinking these wools would be pretty drapey? When I take the batts off the drum carder, they just flop over my hand, draping perfectly, but they also have a good "puff" to them - that's the finewools doing their thing in the blend. I think the spun yarn will have some nice loft as well as nice drape and while I won't officially decide what pattern to use for this finished yarn until the yarn is finished and I know exact yardage and weight, I've pulled out my Knit Kimonos book and I've been thinking about using one of those designs with this yarn. If the finished yarn has the kind of drape that the batts are showing, it should be beautiful for a kimono shaped jacket. Oh, and if anyone is curious, my drum carder is a Strauch Petite with the brush attachment. It's reasonably priced and easy to use, works with a wide variety of fibers and makes a nice batt size. I got it about a year ago and I'm very happy with it. Don't just think that you can only card washed, unprocessed fleece on a carder - this project is all about blending already processed and dyed rovings. Having a carder gives you the option of making up your own color blends and fiber blends to really make the EXACT yarn you want in the EXACT quantities you need. Also, seven year old boys think they're fun and will turn the crank for you. I finished the Berry Lace Cardi and all the pieces are blocked. I'm going to sew it together tonight and hopefully I'll be able to get some pictures of it tomorrow. In the meantime, I've finally cast on with my Dream In Color Classy yarn (colorway is Cool Fire). I decided to go with the Chinese Lace Pullover from Knititude for my pattern and so far, it's working up nicely. The only change I've made at this point is to eliminate the waist shaping. As the pattern is written, the waist is 7 inches smaller than the hip/bust measurement and while that would make a very pretty sweater, the stitch pattern in the body is a rib. Since ribs draw in, I decided to just skip the waist shaping and let the ribbing add the shaping. A side benefit to this is that I'll have room for ice cream! The pattern has directions for working the pullover in the round as well as flat, and since this is wool yarn, I'm working it in the round. If I was knitting it in cotton or silk, I would knit the pieces flat because seams add structure and would keep these inelastic yarns from stretching out. 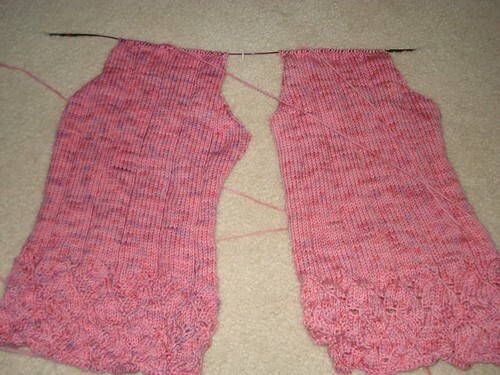 I might knit the sleeves flat, just so I can knit them both at the same time, but I haven't decided yet. 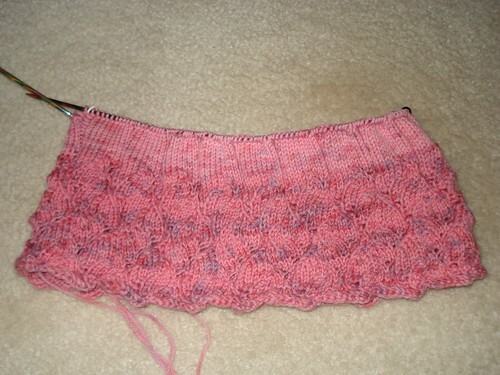 I'm past the lace section at the hem and have started the ribbing for the body. This yarn is so soft, I just know I'll love the way this sweater feels. 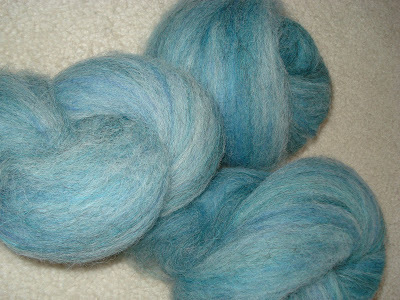 The Loopy Ewe has more of it in stock now, so if you missed out the first time, go get some! I'm dying to get some Into the Mystic and Go Go Grassy for other projects, but I'm trying to wait until other people have a chance to get some of this yarn before I go back for seconds (or thirds).